After much controversy, the Boy Scouts of America executive committee just voted unanimously to allow gay adult leaders. The move brings to an end decades of discrimination by one of the country’s most popular youth organizations. “As a result of the rapid changes in society and increasing legal challenges at the federal, state, and local levels, on Friday, July 10, the Boy Scouts of America Executive Committee adopted a resolution amending the adult leadership standards policy. The resolution was unanimously adopted by those present and voting. “This resolution will allow chartered organizations to select adult leaders without regard to sexual orientation, continuing Scouting’s longstanding policy of chartered organizations selecting their leaders. The National Executive Board will meet to ratify this resolution on Monday, July 27. This whole shenanigan has been a bit of a doozy. So allow us to provide a chronological recap. In 2013, the BSA finally voted to allow gay scouts. Now, there’ve always been gay scouts and gay adult leaders, but the issue tracked broader societal trends. Scouting is largely a de-centralized organization, with the national board providing guidance to independent councils and their troops. Each troop has its own sponsoring organization — typically a church, school or similar community stalwart — and each troop’s politics tended to follow that of its sponsor. If one of the kids was gay, it was up to that troop to decide if they wanted to make a problem of it or not. Gay adult leaders mostly just weren’t too open and, so long as their troop was happy with that, they got along fine. Things got more complicated as the politics around homosexuality grew heated over the last decade or so. In voting to allow gay scouts, the BSA effectively banned gay leaders. And that problem was doubled by the tradition for Eagle Scouts — the organization’s highest rank — to continue with their troop as adult leaders on their 18th birthday. The move effectively turned guys who had dedicated their lives to scouting out into the cold once they became adults. So, the same groups that campaigned for the acceptance of gay scouts turned their efforts to gay adults. And Scouting itself acknowledged it had no problem with homosexuals serving as gay adult leaders. Last year, I asked National Commissioner Tico Perez if the BSA considered gays to be pedophiles. Instead, the issue seemed to lie with the churches and other religious organizations that sponsor local troops and fund the national organization. No one would say that, of course, but you got the feeling that the BSA’s leaders felt their hands were tied. “I would have supported having gay Scoutmasters,” Robert Gates, the BSA’s President said shortly the vote to allow gay scouts. Then, in May, Gates issued a proclamation that the BSA would no longer seek to revoke the charters of local councils and troops that decided to allow gay adults. This was a tacit permission at the national level for those councils and troops to set their own policy. But, the BSA still, at least formally, stated that it did not permit gay leaders. Eliminate the BSA’s across the board ban on openly gay or bisexual adults in scouting. Allow each individual troop or unit to determine its own policy regarding the eligibility of openly gay or bisexual scoutmasters or other adult leaders. 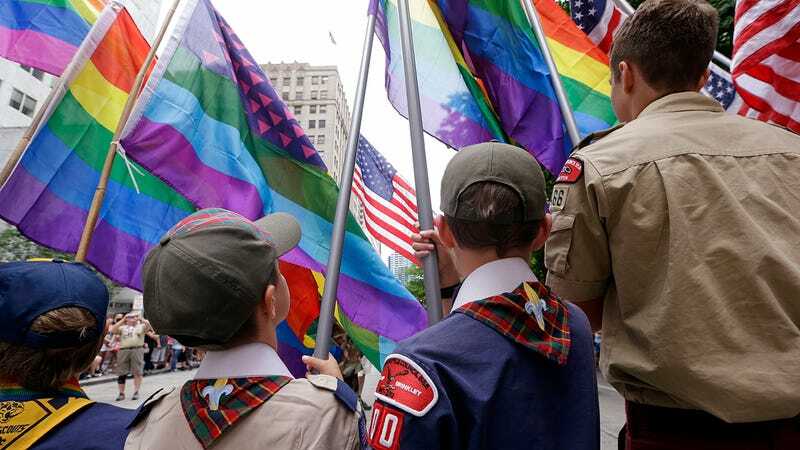 Prohibit regional governing councils or non-Troop entities such as boy scouts camps from discriminating against employees and volunteers based on their sexual orientation. Allow previously removed leaders to reapply for their positions.